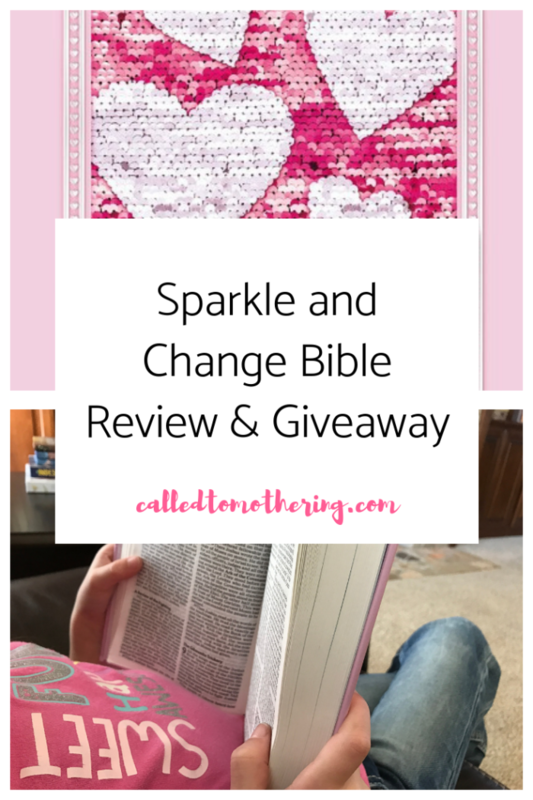 Disclaimer: I was provided the Sequin Sparkle and Change Bible for the purposes of reviewing and hosting a giveaway. All opinions, however, are my own and have not been influenced by the author/publisher in any way. One of the most important habits we’ve established with our children is daily Bible reading. It started with me reading storybook bibles aloud to them when they were younger, and has now progressed to each child reading on their own in the morning. Their relationship with God has grown as they’ve discovered His love and character in the pages of His redemptive story. They have also learned from the strengths, weaknesses and mistakes of different people throughout the Bible. Currently, my ten-year-old will read the NLT Version on his iPad and then journal about what he learned and how he can apply it. My seven-year-old is kind of in that in-between stage where she’s outgrown a storybook or para-phrased Bible, but isn’t quite ready for one with language easily understood by teens and adults. The Sparkle and Change Bible has been the perfect way to bridge that gap for her! 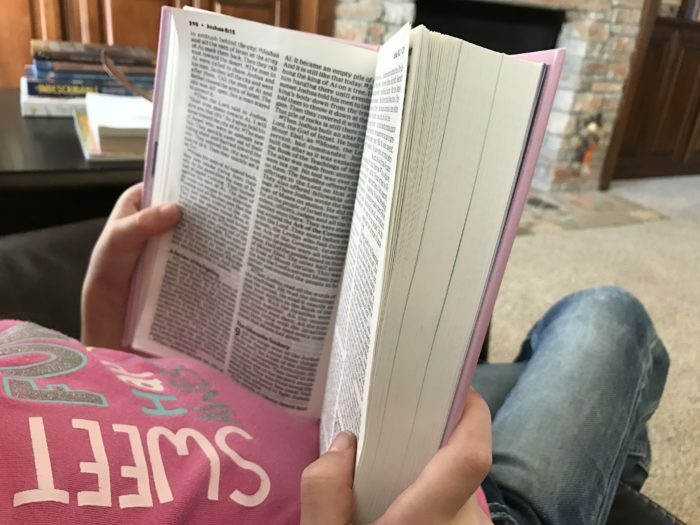 She was so excited to receive her first “real Bible”, and couldn’t wait to begin filling in her personal info as well as favorite verses inside. My daughter struggles somewhat with reading, but after two chapters of this Bible, she was able to accurately summarize what she had read. Written in a simple to understand format for a child, it still maintains the integrity, richness and beauty of the Word. The ICB, the first Bible translation created specifically for children, is ideal for those with at least a third-grade reading level and is typeset in a large, readable font. The text is set in ten-point type, with bold in-text subject heads that help kids easily find the passages they are looking for. Also included are boldface words that correspond with a dictionary and concordance entry to explain word definitions. A great new feature in this updated setting is more than 300 key verses that are highlighted throughout the Bible for kids to read and learn! Like most girls, if it’s pink and sparkly my daughter has to have it. This Bible is both! A sequined sparkly cover on the front provides endless fun and makes it something she wants to carry around everywhere. Made of the same material that’s popular on purses and pillows right now, the “mermaid” sequins change color depending on the way your child swipes. My little girl loves moving her hand over them to reveal heart patterns beneath the pink background. It is also available in light blue with rainbow colored sequins. 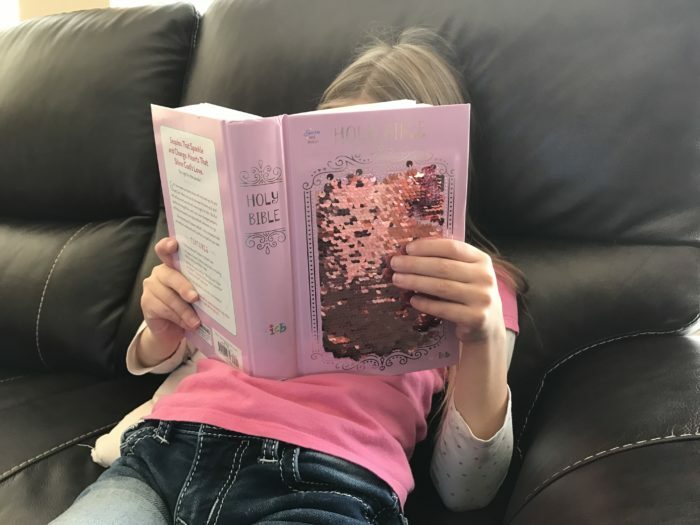 The Sparkle and Change Bible is perfect for kids ages 6 to 10 to take to Sunday school, read with the family and study on their own. The unique, vibrant look helps them express their style and faith wherever they go. Just like the sequined cover sparkles and shines, the more they read God’s Word, the more their hearts will shine with truth and joy. They’ll see their lives “sparkle and change” as they spend time with Jesus every day! Click the banner above to enter the giveaway and win a copy for your daughter, or another special little girl in your life. 5 Winners will be selected on 12/05/2018 and notified by email. Done! Thank you for hosting this giveaway!